Wouldn't it be great if shower doors were self cleaning like a dishwasher? Unfortunately, keeping a bathroom clean and healthy is a difficult task...especially with kids and no maid. Glass has a porous surface that will absorb soap, body oils and hard-water minerals if you don't squeegee off the water after each shower. A cloudy haze also develops if you don't use a good glass cleaner regularly. Want the best way to keep shower glass clean? Use a squeegee after you shower - and wipe everything dry with a soft cloth. But seriously ... who has that kind of time? However, if you don't squeegee and water dries on the glass, it leaves behind a chalky-white haze and layers of YUK that need to be dissolved with cleaners. 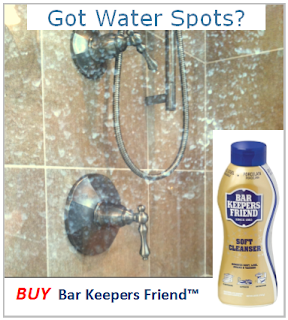 To prevent soapy water spots use a good glass cleaner (with no ammonia) at least once a week. 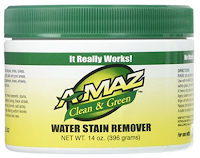 If the glass is still a little scummy, try a mildly abrasive water spot remover. This requires a little elbow grease but is definitely worth the effort. With regular maintenance,your shower glass will be clean and healthy for years to come. So start with a clean slate by removing any smudges or dirt left behind the contractor and squeegee on ! Here are a few popular suggestions to help you dissolve and remove that scummy stuff on your shower glass. Make a 50-50 mix of white-vinegar and water in a spray bottle. Soak the glass and use a soft rag or dryer sheet to scrub the glass. Then rinse, squeegee the glass and buff it dry with a micro fiber cloth. Smear a liquid dish-washing detergent like Cascade® on the glass. Cover the glass with dryer sheets and leave covered for 15 minutes - scrub the glass using the dryer sheets - rinse -squeegee - wipe dry. Squeeze the juice from a fresh lemon and mix with 2 cups of club soda and 1 teaspoon of corn starch in a spray bottle. Spray mix on glass and let it soak a few minutes, Rub glass with a non-abrasive sponge, rinse, squeegee and wipe dry. Some folks still use a glass cleaner afterwards to give it that healthy shine. CLEANING TIP #3 - Tough water spots need to be dissolved, so try one of these homemade cleaning mixtures above. Buy a good squeegee and use it after every shower. 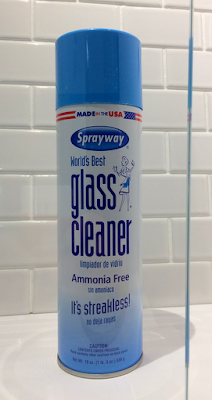 Use a quality glass cleaner that's ammonia free. 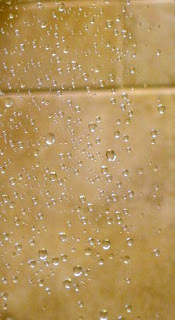 Rain-X ® can be applied to glass to repel water and soaps. CAUTION: Apply sealants and wax to glass surfaces only - protect from over spray. Do not apply to floors or adjacent surfaces as they become slippery and may be damaged. NOTE: Even if you paid to have a water repellent coating applied to your glass, soap and hard-water minerals still need to be squeegeed and cleaned regularly. A glass sealant just prevents it from permanently etching a hazy cloud on shower glass. Read the manufacturers labels and follow safety precautions. Bar soaps leave behind more soap scum than liquid gels. Some cleaners scratch lacquered hardware and soft materials like brass and aluminum. Beware of abrasive products and ones containing ammonia, bleach or harsh chemicals. CAUTION: Sharp metal objects, abrasive instruments or razor blades can permanently scratch the surface of the glass and metal. Take adequate safety precautions like gloves, goggles and proper ventilation. 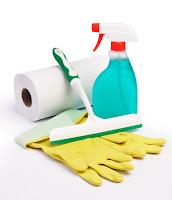 Test cleaners in a small hidden area to make sure they don't damage anything. Be careful of over-spray and cleaners dripping onto adjacent surfaces. Thoroughly rinse off cleaners before they dry, then wipe dry with a soft cloth. Some cleaning products and homemade mixtures have strong fumes and require adequate ventilation. Don't leave cleaning remedies around unlabeled. Be sure to empty and rinse spray bottles then dispose of responsibly.